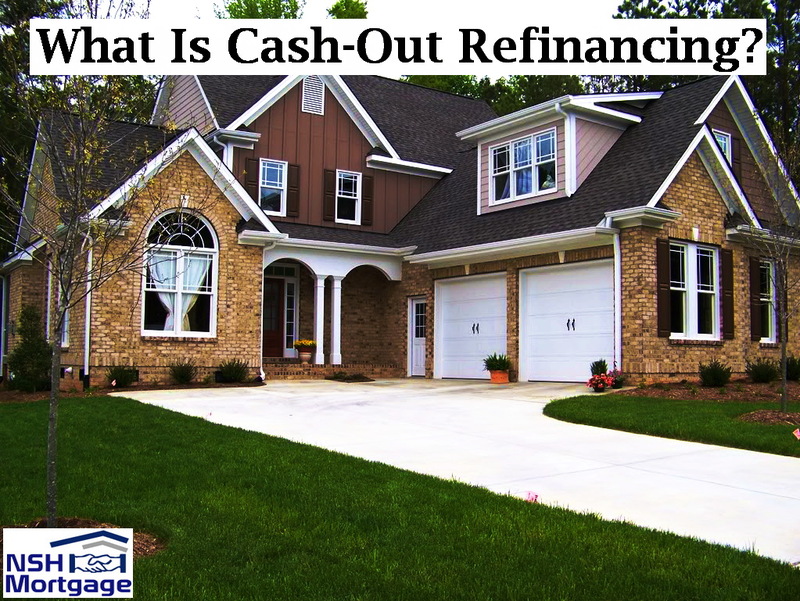 What Is Cash-Out Refinance? NSH Mortgage has the wisdom and tools to help you fully understand and acquire cash-out refinancing if it is available for you. Cash-Out Refinancing is a way to exchange your home value for cash, without selling it. As you faithfully pay your monthly mortgage payments, you accumulate equity. And many times, your property increases in value over time. That means you have the opportunity to get money for that equity. The rate and term refinance replaces your old mortgage with a new one, and the new loan amount is the same as the closing balance of the old loan. The limited cash-out refinance allows you to wrap the refinance closing costs into the new mortgage, so its starting balance is a little larger than the closing balance of the old mortgage. The cash-out refinance allows you to refinance with a larger mortgage than you need to just pay off the old loan and the closing costs of the new one. This new mortgage results in the borrower getting cash in hand at closing, or paying off debt that was not used for the purchase of the home. Who Benefits From A Cash-Out Refinance? Cash out refinancing is one of the cheapest sources of money available. That is because your home secures the loan. This makes financing less risky for lenders, and they reward you with lower interest rates. Cash out refinances can help improve cash flow by paying off other debts with higher interest rates or payments. They also can be good sources of funding for education for your children. Actually, the money can be used for almost anything, including home improvements, investments, medical bills or a swimming pool. Some of those home improvements can actually increase the value of your home, adding more equity back into the house. Cash-out refinancing is usually less expensive than selling your home to get money. Experts put the cost of selling, moving and buying a new home, about ten percent. It depends on the loan program and your qualifications. The total loan amount will not normally exceed 80 percent of your property value for a conforming conventional loan, 85 percent for a FHA loan, or 100 percent for a VA loan. Usually, cash-out refinancing costs more than rate and term or limited cash-out refinancing, and those extra costs reduce the amount of cash available to you. Should You Choose A Cash-Out Refinance? How long do I intend to stay in this home? How will this refinance affect my monthly payments? Is this the best use of my equity? If you do not plan to stay in your home very long, or you cannot improve on the terms of your current mortgage with a new home loan. It might be cheaper and smarter to choose a home equity loan to get your cash. Most refinances will involve closing costs, and you maybe required to have enough benefits to retire the closing costs in a reasonable period of time. If you plan to use the proceeds for something like a new car or vacation, think twice. Finance experts do not recommend financing short term items with long term loans. Do you really want to spend the next 30 years paying for a week’s fun or a car you keep for five years? Home equity is the primary way many families build wealth, according to Harvard University’s Joint Center for Housing Studies. Cashing out home equity is just like pulling money out of your retirement account, because when you sell your home, you will have less equity for your future. In addition, cash-out refinancing costs can be higher, and they are based on the entire loan amount, not just the cash out. If you owe $100,000 and want $10,000 cash out, and the fee for cash-out is one point (one percent of the loan amount), it can cost you $1,100 to borrow $10,000. That is a 11 percent surcharge. The Consumer’s Guide to Mortgage Refinancing emphasizes that you should consider alternatives before taking a cash-out refinance. Home equity lines of credit (HELOCs), for example, often come with no closing costs. They can be great for funding a series of home improvements or paying annual college tuition. Home equity loans are (usually) fixed rate second mortgages that may be cheaper than cash-out refinancing. Lifestyle changes are an option for slimming down expenses. And there is always eBay if you have any extra stuff you can sell. Underwriting standards for cash-out refinances are usually higher. That is because these mortgages are riskier for lenders than rate and term loans. Many lenders will not allow cash-out refinancing for vacation or investment properties. For a Fannie Mae or Freddie Mac cash-out refinance, the minimum credit score for cash-out refinancing is 40 points higher than for rate and term loans. If you want an adjustable rate mortgage (ARM), expect lower loan to value limits and tougher underwriting.